David Willis is a teacher of Bushcraft and Wilderness Living Skills. He can be found baking bread and rustling up tasty meals over a campfire, whittling spoons, foraging for edibles, walking in the woods and soaking up everything nature has to offer. He has served with the Royal Engineers in Belize, spent time living alongside the Maasai in the Rift Valley and learning from the Bushman of the Kalahari, motorcycled around Europe, built and paddled his canoe along British rivers, and loves heading out on adventures. Escaping the corporate world was his best decision ever, with a long career in technology development and consulting, David now loves teaching adults and children, sharing the skills needed to enjoy living life and having fun outdoors! 16th May 2017: Berkshire and Buckinghamshire Life writer Venetia Hawkes joins David on a magical journey of discovery in our local woodlands (read article in Berkshire and Buckinghamshire Life). 14th December 2016: The Guardian picked David’s woodland walks as one of their the best guided walks around Britain. Embracing the great outdoors in the dead of winter is a lot easier in a group and with a knowledgeable leader for motivation (read article in The Guardian). 26th August 2016: Escape the phones and tablets and discover the secrets of dining in the real outdoors – Venetia Hawkes writer for Berkshire and Buckinghamshire Life did just that in Buckinghamshire woodland (read article in Berkshire and Buckinghamshire Life). David enjoys teaching adults just as much as he does children and youth. So whilst one day he may be teaching adults the skills needed for a team building exercise, the next may be teaching young children how to safely light a fire or youth how to whittle with a knife. Whenever David is not teaching, he is out honing his skills, his current projects include hide tanning and flint knapping. 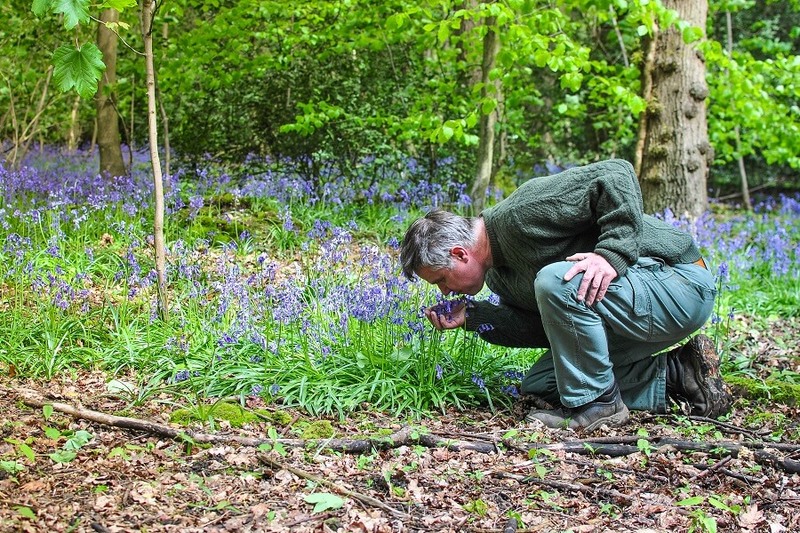 David provides Bushcraft courses, activities and events at a private woodland in the Chilterns, and at clients own premises and locations used when working with other outdoor activity providers. He teaches mostly in the South of England, within the home counties of Buckinghamshire, Berkshire and Hertfordshire, and more widely from Somerset in the South West to Kent in the South East. He also provides regular family friendly guided woodland walks! From an early age, David loved being outdoors. In those formative years, he had fun exploring the local parks and woodlands, building camps and lighting fires with his friends. Camped out, they were always slightly nervous about who would find them and spooked by the unfamiliar sounds of wildlife. Now, years later it’s wonderful to help others regain some of those often lost childhood experiences, become confident living outdoors and connect with nature and all she has to offer. David is a professionally accredited / qualified Bushcraft instructor of 8 years standing, with a former career in the information technology industry after serving with HM Forces in The Royal Engineers. Trained in First Aid and an expedition leader for lowland Britain, David is a ‘Certificated Practitioner’ with the Institute for Outdoor Learning and active member of the Bushcraft Professional Practice Group (PPG) – both as a participant and in workshop delivery. David achieved the Bushcraft Leadership & NCFE Level 3 qualification in 2009/2010, covering: outdoor living skills, natural history, woodland crafts, leadership and instruction (and a whole lot more – you are welcome to ask!). A fabulous and challenging year of education under the instruction of John Rhyder (formerly chief instructor for Ray Mears), living in the wilds of West Sussex at his Woodcraft School. As a professional Bushcraft instructor, David maintains public liability insurance for the protection of students and the woodlands where he teaches and for when he works with children or vulnerable adults he has a current enhanced DBS / CRB certificate.